The golf world recently mourned the passing of Arnold Palmer – those of us who ply our trade in the golf industry owe a debt of gratitude to this modern day professional sport crusader – Arnold Palmer raised the bar in golf by his standard of play, his magnetic personality and by being a pioneer in modern day sports marketing. Of course, timing is everything but Arnold Palmer’s business acumen found a worthy partnership with the now legendary Mark McCormick and IMG. That vision by extension would have a connection to our shores as well – IMG marketed the Big Three of Palmer, Jack Nicklaus & Gary Player – many older golfers will recall that Gary Player in the 1960′s was the Touring Golf Pro representing Castle Harbour in Bermuda. Personally, I can vouch for positive impact of Gary Player’s Bermuda connection via the awareness of Castle Harbour Hotel that I experienced around the world during my tenure as their Touring Golf Pro on the PGA European Tour in the early 1980′s. Arnold Palmer’s life touched millions of people in a way that was uniquely special to each person – I feel certain his humble beginnings and the influence of his parents played a significant role in developing a persona that would draw the working class community toward a game long dominated by country club golfers. In the mid 90′s, while golfing professionally on a regular basis, the Orlando community afforded me an unexpected honour of an Arnold Palmer encounter that would persuade me to enlist in ‘Arnie’s Army of Supporters’. 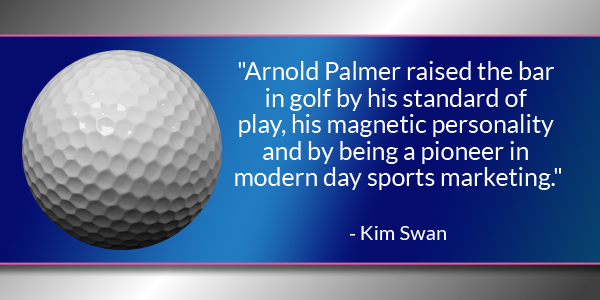 Mini Tour players often had regular high stake games but one fateful day ‘The King’ came out and played with the boys trying to break through – admittedly testing his skills before jetting off out west to the skins game – but although Palmer and his partner [the late JC. Goosie] won our event that day, it was how he was one of us in spite of his prowess that left a lasting impression. Ironically, my daughter would be born at the Arnold Palmer hospital where my wife would receive exceptional pre-natal care and also at Arnie’s tournament Bay Hill, where Vijay Sigh and i would be reunited in America and at the same event where my friend Jim Thorpe would take me with him to meet an upcoming young amateur golfer named Tiger Woods. As the world reflects on the passing of Arnold Palmer, I feel duty bound to add my voice to the global chorus celebrating his majesty as a professional athlete, his impact on the economic growth of golf and the love many felt for Arnold following their special encounter. Today, as I teach at Port Royal Golf Course, one of the greatest public golf courses globally, I thank God for the influence of Arnold Palmer- long live his spirit to grow the great game of golf throughout all social stratas.